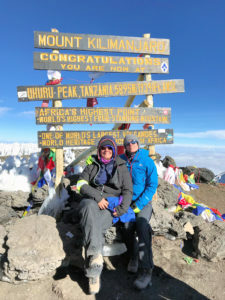 TWO women have completed the challenge of a lifetime – climbing Mount Kilimanjaro in Tanzania, and raising over £12,000 for charity. Jill Cox, who lives in Frome, and her work colleague from Mulberry, Emma Holcombe, tackled the highest mountain in Africa last month. The money raised will be shared between local charity, Time is Precious, and the cardiology department at Bath Royal United Hospital. “The trip was awesome, we are so thankful for all the training we did,” said Jill, “we certainly benefited from it. The summit night was the hardest, but we were focused on our goal and aware of all the support and sponsorship we have received, so we were just determined to make it. “It felt such an achievement to reach the summit, the views were out of this world. With freezing conditions we had to make a quick decent, and some people suffered altitude sickness, but I was lucky enough to avoid it, thank goodness. Above: Emma Holcombe and Jill Cox celebrate reaching the top of Mount Kilimanjaro.